The late 1960s and early 1970s were a fertile period for the Bonynge-Sutherland duo. Whilst fulfilling a fiendish concert schedule, they produced a string of opera sets for Decca with leading artists of the day which have become classics of the catalogue. 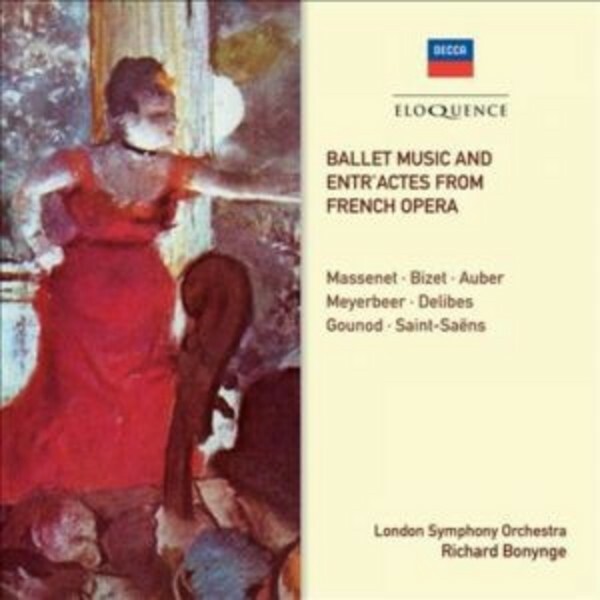 But Richard Bonynge also found time to make recordings of ballet music, overtures and curiosities such as 'Ballet Music and Entr'actes from French Opera', taped in 1971. The world of nineteenth-century opera is rich and colourful, and on this recording we enter a rarely glimpsed but seductive part of it. It is a heady confection of the well-known mixing with forgotten charms. But what makes this issue especially invaluable is the fact that Bonynge recorded two extra items during the recording session for which there was no room on the original LP. One of them is an exquisitely beautiful and haunting prelude from Massenet's Les Érinnyes, the other from Delibes' last opera Kassya, which was orchestrated by Massenet after the Delibes's death in 1891, and first performed in 1893. They are published for the first time. The entire disc has been remastered from the original tapes.